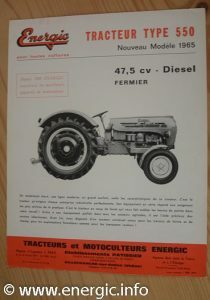 Energic 550 Tracteur – from 28/02/1965. 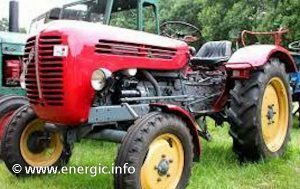 Energic Tracteur 550 – usage medium farm. Cost in 1/05/1965 19,800 frs. 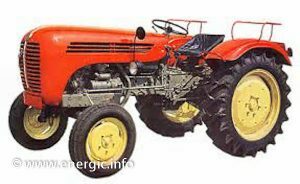 Energic 550 Tracteur ( from1965/6). Engine/Moteur. 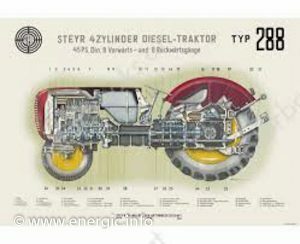 Steyr – 4 stroke, 4 cylinder 47.5cv @ 2400rpm, 2,660cm3. Based on the Steyr model 288/290 (290 66/67 model year?) transition moteur, but 4 cylinder, manufactured from 1960/66 6253 tracteurs produced. Read more about Energic Engine supplier Steyr here. Lubrication. By constant circulation of oil held within the sump of the engine. Gears. The engine offers 6 forward and 6 reverse gears. Blockage differential. Drive type: rear wheel drive. PTO. Independent rear and side. Clutch. Multiple disc type built win with the gear box immersed in oil, within the engine casing. Exhaust/Silencer. Fitted to the right hand side in a frontal position (viewed from the rear looking forward), away from the driver. Steering. Adjustable steering, direct shaft on to gears. Wheels. Pneumatic Tyre/wheels front tyre dimension 600 x 16, rear tyre dimension 11 x 32. Hitch. 3 point hitch hydraulic with height and weight control and towing hook. Dimensions. Length: 3435 mm, Width: 1690 mm, Height: 1625 mm, Wheelbase: 2015 mm, Track width: front: 1280-1680 mm, rear: 1250-1700 mm. Fuel consumption. 1.5 to 2.3 liters of fuel per hour dependent upon working conditions. The tank holds approx. 9 liters. 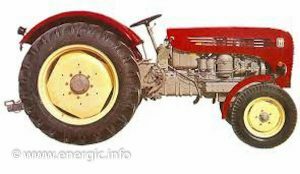 Energic 550 Tracteur (from1965/6) Steyr 288. Weight. 1.930 kgs With additional wheel weights of single or double where available. Also it is possible to fill the tyre with water for extra traction and weight. Electrical equipment. Full electric front and back lights,electric, starter, Battery, dynamo, lights, horn. Brakes. Independent on each wheel, could be dual operated using a connector on the pedals. After the initial new Energic model line up of the 520, 530, 540, 550, 560 and 580 tracteurs was introduced in May 1965, 2 models from this 6 model line up where dropped to streamline the range after a poor start to selling to this different and very competitive market. The line up was then 530, 540 (just narrow/vigneron model), 560 and the huge 580 tracteurs. Sales remained poor and the trading partnership between Energic and Steyr stopped. At this point the Energic range reverted back to smaller tracteurs. The line up included the 511 petrol, the 512 diesel, the 4 RM diesel range, the new second series 519 (with Ramus or MGF hydraulic rear lifts) and the smaller 521 vigneron 2 cylinder tracteur both diesels. 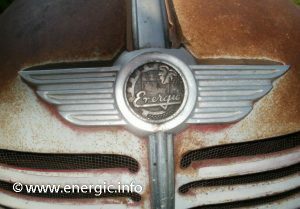 These tracteurs where Energic own and represented there last efforts to stay in the small to mid range tracteur market. as the competition increased from very large tracteur brands in there home market. Read more about Energic Engine suppliers Ruggerini here. Read more about Energic Engine/Moteur supplier Peugeot here.